A violent merger between two galaxy clusters appears tohave split ordinary matter from dark matter. NASA's Hubble Space Telescope and Chandra X-rayObservatory show dark matter from each cluster appearing to pass through thecosmic mess unscathed, leaving ordinary matter behind in the galactic pileup. 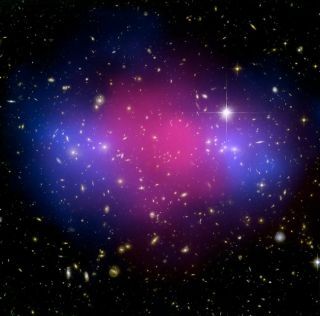 Nobody knows what dark matter is, and it has never beendirectly detected. Its mysterious presence is known by observations of how itaffects regular matter or light, which can be bent by gravity. Astronomers saydark matter makes up as much as 90 percent of all matter in the universe. Hubble helped map out the distribution of dark matter inthe collision by seeing the bendingof light around areas with dark matter. Chandra spotted X-rays from the hotgas that makes up the bulk of ordinary matter in the clusters. The latest observations of the MCSJ0025 cluster appear toto back up earlier findings from another cosmic collision in what's called the BulletCluster. That impact also tore normal and dark matter apart anddemonstrated the forcible separation of ordinary and dark matter. The same separation suggests that dark-matter particlesinteract only weakly outside of gravity's influence, given that they passed byone another inside the collision zone with little visible effect. The research team also estimated the mass distribution ofboth dark and ordinary matter by using Hubble's visible-light images. Eachcluster boasted almost a quadrillion times the mass of the sun. Results from the new study of collision, a scene that's about 5.7 billion light-yearsaway and involved speeds of millions of miles per hour, are detailed inan upcoming issue of The Astrophysical Journal.